Helen Brent (Claire Trevor) has been living in Reno for six weeks to secure a divorce. She’s taken up residence at a boarding house run by Laury Palmer (Isabel Jewell) and Mrs. Kraft (Esther Howard). With her divorce finalized, Helen makes plans to leave and spends a night out on the town to celebrate. But upon returning to the boarding house, she is met with a gruesome scene. She finds the bodies of Laury and her boyfriend, Danny (Tony Barrett). They’ve been murdered. Rather than contacting the police and sticking around to file the incident report, Helen decides to speed up her exit from Reno, boarding the next train to San Francisco. But trouble just may follow her back home, as murderous Sam Wilde (Lawrence Tierney), Laury’s killer, is on the same train. 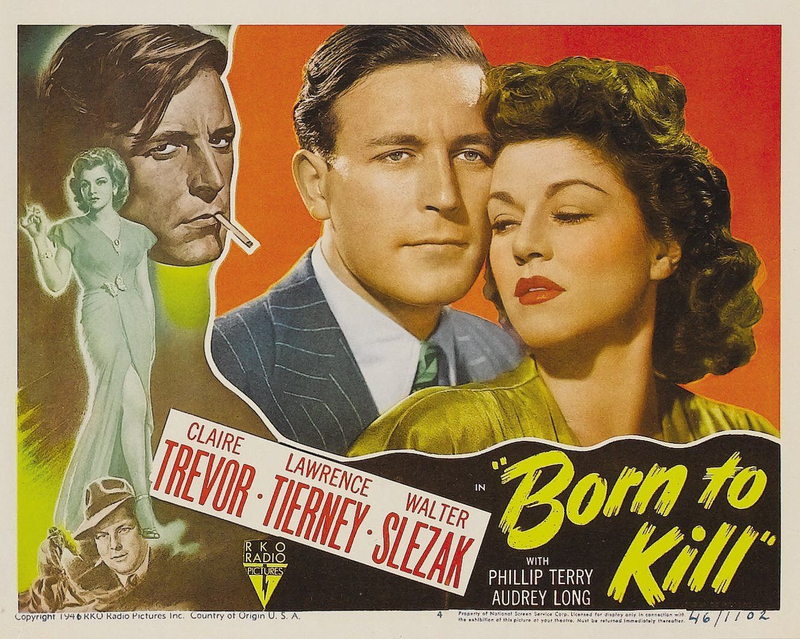 Born to Kill is a film that grips the viewer from the very beginning with a dark tone and an engrossing story. Early on, we see Sam commit two murders, and then see he and Helen head off to San Francisco on the same train. Though a serious crime has already been committed, the viewer gets the sense that things can only get worse from here. And worse, things certainly do get. As the already-engaged Helen rejects the advances of the alluring-but-evil Sam, the murderer turns his attentions to her naive sister, Georgia Staples (portrayed by Audrey Long). A romance between a criminal and a rich, innocent woman can’t possibly end well, especially when said criminal is still interested in Helen. There’s an inherent sense of dread that saturates the film due to the simple premise of this twisted love triangle. Further complicating the situation is the love/hate relationship between Helen and Georgia. They’re half-siblings, and while they care about each other, there’s also a rift between them caused by money. Georgia’s father, a newspaper tycoon, left her a great inheritance when he died, leaving Helen to feel like a “poor relation.” She’s protective of Georgia, but also very envious. There’s an odd dynamic between the two characters as a result, and it’s portrayed very convincingly by the two actresses. Lawrence Tierney gives an appropriately-menacing performance as Sam Wilde, and Claire Trevor is equally fantastic as Helen Brent. Their scenes together are emotionally-charged and full of electricity. Both actors are well-cast for their roles and have magnetic screen presence, which only bolsters the viewer’s interest in a film that is already nicely-shot and well-scripted. Stand-out supporting performances are given by character actors Esther Howard (as Mrs. Kraft), Walter Slezak (as private eye Albert Arnett) and Elisha Cook, Jr. (as Sam’s right-hand man, Marty). From top-billed stars to minor characters, this cast is perfectly-selected. The “most perverse” title mentioned above may seem exaggerated to the modern viewer, as by our current standards the film is pretty tame. (Even in the highly-tense murder scenes, there is no gore, no particularly shocking images.) But for 1947 it was risky, and it’s a fantastic watch. 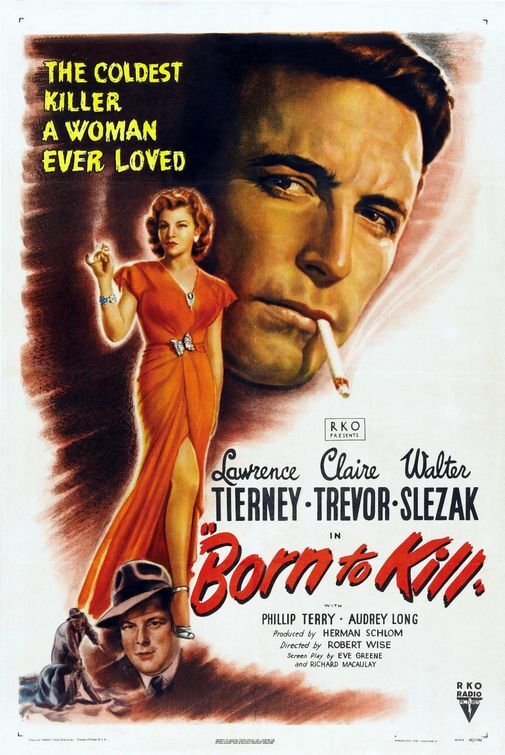 Murder, divorce, jealousy, and infidelity all play a part in the twisted tale of Born to Kill. The score: 5/5! I love this movie. So damn creepy. Glad to hear I’m not the only one who loves it! :) Thanks for reading! It’s one of my all-time favorite noirs. So much intensity and chemistry…and pathology. All of the ingredients for a great film! Haha. Glad to hear that you enjoy it! Not only enjoy, but blogged about, too! Yes indeed, a cool little film noir. I like Robert Wise as a director, especially his early work in noir. And Lawrence Tierney…that guy was something else. Did you ever see him on the episode of ‘Seinfeld’? I guess he tried to steal a butcher knife from the set! Yikes! I’ve heard plenty of “stolen keepsakes from set” stories, but none of them have involved knives haha. I haven’t watched much Seinfeld, but I might have to check out his episode.